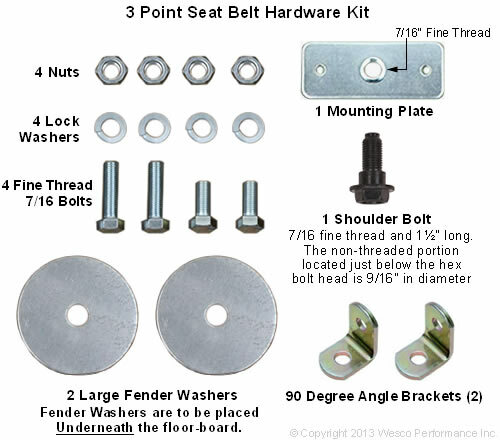 Note: With some vehicles, the anchor point is located on the floor which will require the use of an Angle Bracket. (See Fig. 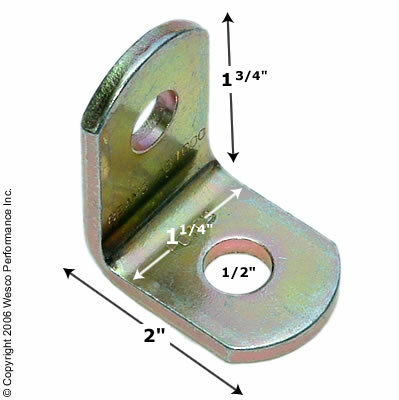 2b to the left) (An angle bracket is included in our optional Hardware Kit # 3pt-rmk.) View Hardware Page Click Here. Important: With some applications, the (A) & (C) Ends anchor to the seat. This should only be done when the manufacturer has designed it in this manner. Important: If manufacturer's anchor points are not present, then special retrofitting must be accomplished to create safe anchor points. Step # 3: Now insert the Shoulder Bolt (7/16" fine thread Grade 5 or better) through the hole in the Long Shoulder Sash (B) End of the new seat belt and screw the bolt into the existing anchor point that is located on the upper door post (usually above the side window of your van, box truck, bus or motorhome) as you can see in Fig. 1 and then firmly tighten. My vehicle does not have a shoulder bolt anchor point. How do I create One? Click Here! 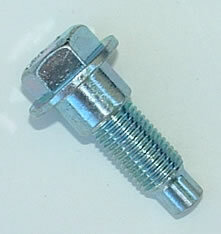 Now snap the Shoulder Bolt Cap down over bolt head as shown in Fig. 3 to the left.